There are some other non-tonal sounds like string squeaks, bowing artifacts, or buzzing against the fingerboard, but those are fine. In some settings even spontaneous feet tapping would work for me (that is, I wouldn't want it removed). The clicks on the picture have little to do with the actual music. They were made by the bassist during recording (for example, the two on the right happen on almost every take of this part of the tune). My question is: Is this normal for a studio recording and what can I do to avoid it in the future? This is a problematic situation, because re-recording that part will be a big hassle, and removing these noises in post-processing is not easy due to within-one-note pitch changes that, among others, give the double/upright bass its unique feel. The way I see it, the producer (me) has the ultimate responsibility of dealing with such issues. In particular I don't want to blame anyone, instead I am looking for things I could do better. So it does seem strange, but still, I could imagine that this is perfectly normal and every record ever made is littered with similar problems, and that's why you record 200-400 takes instead of just 8-30, that's why producing records takes so much time, effort and funding, and this is what producing music is about in reality. So, is this situation normal? What can I do to avoid it in the future? Edit: Here is an audio cut from one of the mics (there were 2 mics and a pickup): FLAC and MP3. In the mix there is also piano, but it plays one-per-measure chords, so unfortunately it is really transparent and it does not obscure anything. The bass will be really exposed – it plays the main theme of the next part in which it has a solo. The situation is normal in the sense that it happens very often. From what I know the most popular way of avoiding it in the future is building your personal experience and working with highly experienced professionals. Ideally, everyone involved in the bass tracking would have both been aware that fretboard noise is a common problem and also been listening for it. The player, engineer, and you should all have picked up on it right away, known it was going to be a big issue when it came time to mix, and addressed it immediately with more takes and/or punch ins. The tried and true method of being aware of all the possible pitfalls in tracking that are not always obvious is to have encountered them in the past. The other method is to work with experienced people who know what to listen for and know the details of their craft and how those details will affect the overall project. In terms of what you can do now, none of your options is without problems. To get the best track regardless of cost or inconvenience, you probably would have to re-record the bass part. Short of that, a decent engineer should have some ideas. EQ and multi-band compression might help. More drastic approaches would include copying other notes played by the bass, pasting them over the problem section, and then pitch shifting and/or lengthening or shortening them as necessity to rebuild the part. Or a sampled bass virtual instrument could replace the real bass in the problem section or just for the attacks of the notes. Production involves lots of compromise. You're the one who gets to decide which compromises are most acceptable. It's definitely difficult to truly weigh in on this without actually hearing the audio. It's hard to speculate as to what the sound might actually be and how present it is in the recording. Based on the image, it appears to have a decent amount of amplitude but if it is a result of a technique, then it may blend in better than the amplitude suggests. Is this something that you hear in the full mix, or is it only really noticeable when soloing the bass part? When you solo a track, you are putting it under extreme scrutiny in a way that you may not need to, depending on the arrangement, of course. A lot of issues like this will basically disappear when they are placed in the full mix, or blend in with the rest enough that they don't stand out. A very well respected engineer, John Wyman, had pointed this isolation issue out to a friend of mine while recording, showing my friends how he wanted his bass to sound, then showing him how he mixed it and how that works better overall, even though it sounded bad or not how my friend wanted it initially, to which my friend agreed. So the sound itself was not what my friend thought he wanted, which would only be confirmed by soloing the track, but it sounded great in the mix. Even though it seems unrelated, I feel that spells out the issue with soloing things when in the end, they will be a part of a mix. Overall, most recordings are filled with extra noises, from people breathing, to tapping feet, to squeaky seats. 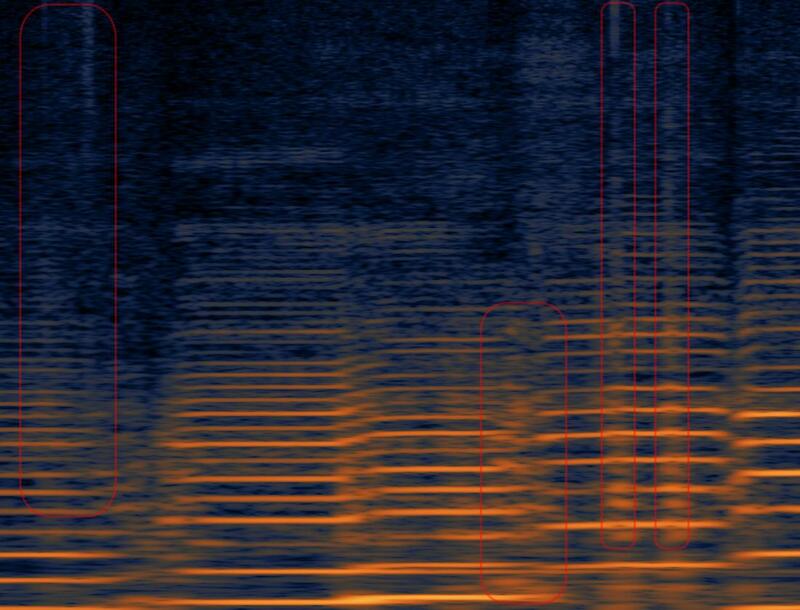 Most of the time, these end up becoming obscured in the mix of all instruments together, or maybe can be heard but only if you're listening closely. Professional modern recording often times seeks to have everything completely polished, with absolutely zero mistakes or inconsistencies, which is ultimately not how music occurs... we're not robots, after all. This often times includes taking extensive measures to avoid minor things, like breathing or foot tapping, as well as extensive post production work. Many genres are known for this. Pop music in particular tends to be unrealistically perfect, with modern tools allowing for time manipulation of individual parts, pitch correction (not the autotune effect but subtly correcting the pitch), samples to replace drum sounds, etc. In the past, imperfections were a part of the recording and lots of people listen back with nostalgia, eagerly pointing out the little things that were not intended on a given track. For instance, at the very end of the Beatles's "A Day in the Life", you can hear the piano bench squeak a little and papers rustling. People also suggest that Paul Chambers made some mistakes on Coletrane's "Giant Steps". In the end, no one is complaining about these issues, even though they almost definitely would have been corrected in a modern recording. So it seems likely that this could blend into the mix, or might end up being audible but only when very closely listened to. You also want to consider the level of this production and its intended use. If this is for a local band that probably won't get radio air time, then it's a little less to worry about now and a good lesson for something to look out for in the future. If this is a serious recording that will get radio play or put in a movie or something along those lines, then it's probably worth trying to rerecord the part if it is still audible in the mix. Again, it's hard to say what's going on and how bad it is without hearing it, so if you can put a piece of it on soundcloud or something and post a link in the question, we all will probably be better able to answer. If you do this, I might suggest uploading the track soloed and one with it in the mix, even if it's just a rough mix. My wag: Something on the bassist unintentionally hits the bass as he/she adjusts his/her playing position. The scenario I'm envisioning is that something, a ring, a button, a belt buckle, maybe even just his/her foot or the heel of his/her hand, is hitting something and making enough sound to get picked up by the mic. I see the bass itself, as a big resonant object, as a likely candidate for what is getting hit. It occurs at the same time in the piece since it occurs when the player in some way shifts his/her position relative to the instrument, e.g. going from being more pulled away from the instrument to being closer, hunched over it even. But it is not exactly in time with the music because this is just ancillary body motion to that the player uses to set up his/her position for playing. Consider how Esperanza Spalding adjusts her posture with respect to the bass in the first song in this performance. If the performer is making these kinds of adjustments, and either (a) does it more vigorously and just bumps the instrument, or (b) has something hard that hits the instrument, I'd expect that you can get an audible click/thump. If the analog monitoring was ok, my bet would be on lost samples, namely a problem in the digital recording chain. If you are involving general-purpose computers for any of the recording, I'd try using a hand-held recorder or similar standalone device for recording the analog mix (if available) or the voice you worry about separately. If there are no clicks in that recording, the hard-/firm-/software of your computer and soundcard is not up to making clean and reliable recordings. Of course there can be other sources, like a refrigerator switching itself on and off (they can be rather awful on the power net). I have to switch off a wall clock two rooms away when recording because it is picked up by my mikes. The audio snippet is a bit too short to say much, but it's certainly not one of the clicks that good bassists use semi-deliberately for rhythmic emphasis. In fact it does sound more like the result of a technical struggle – perhaps some hard-to control bow oscillation, tricky position changes etc.. Keep in mind that it's very difficult to play fluent lyrical passages on double bass – it's not a simple instrument at all. I know really good contrabassists who can't pull off such passages quite satisfyingly, and very few who can actually do it reliably. So as for how to prevent this kind of problem in the first place, my unsatisfying counsel would be to have a bassoon, cello or viola play the part instead...(these are also not easy but more specialised for lyrical playing). Or else consider transposing the piece so it's better playable on bass. As an engineer, there's really not much you can do about this. As a player, there are some things you can do – lower the action, try different strings, switch from german to french bow... and for click sounds specifically, of course make sure there are no hard buttons or similar that could be audible over the corpus. Not the answer you're looking for? Browse other questions tagged recording double-bass production studio or ask your own question. How many sound interface inputs do I need to record drums? Do I need humbucking pickups?